So I think the bosu is a good piece of equipment for a handful of exercises, but I don’t think it should be used near as much as I see trainers all over using it. I don’t think every trainer under the sun should be using it with all of the clients especially their beginning exercisers. The theory behind using the bosu is that it creates an unstable environment so that all of a person’s stabilizer muscles must activate while doing the exercise. It is supposed to engage and work your core more. The bosu bothers me even more than seeing someone doing 1,000 crunches on the floor to get great abs…ok so maybe both bother me equally…. But still! There are so many better things you can do to work your core and stabilizer muscles than doing a bicep curl on a bosu! Need an example? How about pull ups or chin ups…assisted or unassisted. Pull ups and chin ups work your biceps and they work your core. PLUS they work your lats! AND they are WAY MORE FUNCTIONAL than a dang bicep curl on a bosu. Can I also just ask…how is a bicep curl on a bosu supposed to be more functional and better for a beginning exerciser than an assisted pull up? Maybe it’s just me but doing most exercises on a bosu just seems more dangerous. I mean why do a bodyweight squat on a bosu when you can work your legs harder and engage all your core stabilizer muscles by doing a front squat? Why not do a one leg straight leg deadlift if you really want to work your balance? Why use the bosu to create more instability? How is that really better for a beginner exerciser? How is that really more functional? Why do we always try to make diet and exercise more complicated than they have to be? Why can’t we just go back to basics? Why can’t we just jump and squat and climb and lift heavy things? Why can’t we sprint and push things and play? Stop over-complicating things! You want to gain functional strength and work your core, do movements that mimic stuff you do in everyday life. 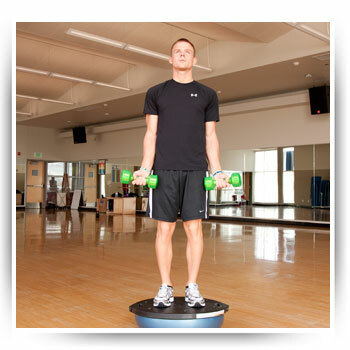 Don’t waste your time balancing on a bosu! 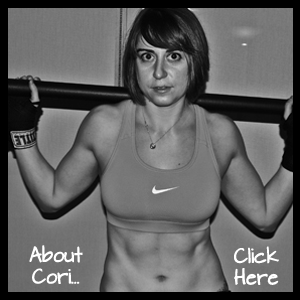 Posted on July 5, 2012, in Benefits of doing "man" exercises, Conventional Wisdom - How I hate you, Workout and tagged bosu, chin ups, functional training, Pull Ups, straight leg deadlift. Bookmark the permalink. 7 Comments. I did bodyweight squats on the flat side of a bosu ball today as a warm up while waiting for some guy to finish his bicep curls in the squat rack. A trainer told me to do them to build my balance and leg strength, but I’d rather just do squats. Ok don’t even get me started on people doing curls in the squat racks haha. I just don’t get the bosu. There is no surface that we move on in every day life like that! And if you want to build up balance and leg strength, try one leg squats! It takes a ton of leg and core strength, not to mention balance, to do a full pistol squat! You would have laughed at the exchange. I asked the guy if he was done, and he said, “In a couple of minutes…what are you going to do?” I said, “Squats.” He goes, “oh…I guess you need this then…” and trails off. YA THINK? He then went and did like four different other kinds of bicep curls. UGH! That honestly is one of the worst situations EVER! I always want to make a really mean comment, but manage to refrain myself. One day though! Hi there! I’ve been lurking on your blog for a while and really enjoy it. Good post and great blog! Haha I think a balance board would maybe be more accurate even? Do a squat to bench or squat assisted by a TRX band to work up to a pistol squat! And I agree there are a few instances where it is good BUT for most things done on it, there are better exercises. Thanks for the pistol squat tips!